From left, postdoctoral fellow David Otuya, MD, PhD, primary investigator Guillermo (Gary) Tearney MD, PhD, and research design engineer Hamid Farrokhi, PhD, assess a new imaging prototype device. One researcher’s development of a swallowable, diagnostic capsule underscores the progress and promise of the MGH Research Scholars program. What sort of difference is the MGH Research Scholars program making? Imagine swallowing a small capsule that travels down your gastrointestinal (GI) tract, capturing multiple microscopic images along the way in order to detect Barrett’s esophagus, a precursor to esophageal cancer. 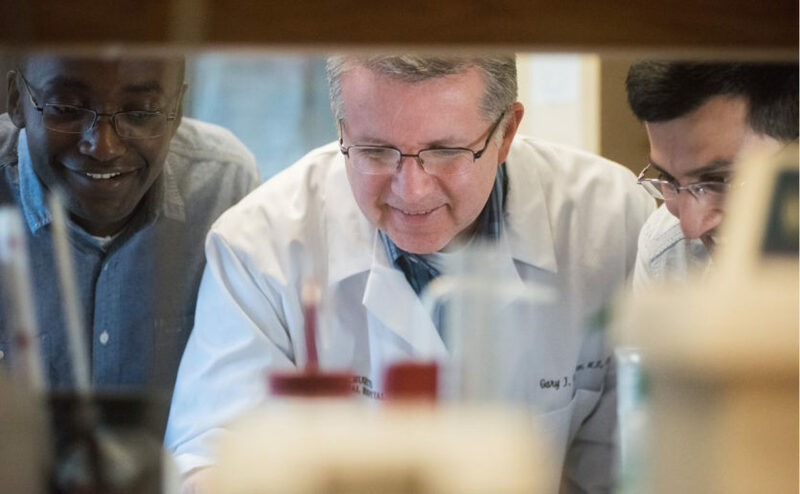 Optics researcher Guillermo (Gary) J. Tearney, MD, PhD, credits his involvement in the MGH Research Scholars program as critical to his success. While this device may sound like something from the future, it in fact exists today. Guillermo (Gary) J. Tearney, MD, PhD, an optics researcher at Massachusetts General Hospital, is working to make it available to primary care practices around the world. Dr. Tearney has long had an interest in GI cancers. Despite the relative ease with which the GI tract can be accessed via the mouth, these cancers still account for more than their share of what Dr. Tearney calls “unnecessary deaths.” For example, about 80 percent of people diagnosed with esophageal cancer die within five years. The traditional approach for diagnosing disease — pathology — can be inefficient, says Dr. Tearney, who was trained as a pathologist. (Pathology involves the study of the causes and effects of diseases, often through laboratory examination of tissue samples.) Dr. Tearney cites the imprecise nature of choosing which part of the organ to biopsy, the risks that come with removing tissue from the body and the extended length of time it takes to make the diagnosis. Dr. Tearney’s solution, known as tethered capsule endomicroscopy (TCE), has received praise and funding from the Bill & Melinda Gates Foundation as well as local family foundations. He credits his involvement in the MGH Research Scholars program as critical to his success. The tethered capsule developed by Guillermo (Gary) Tearney, MD, PhD, captures images of the gastrointestinal tract. Founded in 2011, the MGH Research Scholars program was designed to give exceptional early- and mid-career investigators like Dr. Tearney the funding they need to make transformative advances in their research. This mission is particularly important in an era when funding from organizations such as the NIH is limited. Mass General researchers must make it through a very rigorous and competitive hospital-wide selection process to gain acceptance to the MGH Research Scholars program. After selections are made, donors who have committed the amount of a full award — $500,000 over five years — may choose to have one of the MGH Research Scholars named in their honor. Donors may also make a gift of any amount to the program. All donors are offered opportunities to connect with the individual researchers. The funding enables MGH Research Scholars to hire more researchers, purchase new equipment and make other essential investments. MGH Research Scholars like Dr. Tearney have also leveraged the money to pursue work that is unlikely to receive initial funding from traditional sources such as the NIH. By generating relevant data from their research, they better position themselves to attract future funding from the NIH or, in Dr. Tearney’s case, the Gates Foundation and other organizations. In fact, the first 42 MGH Research Scholars were awarded 277 grants from outside sources totaling over $292 million. In addition to the financial benefits, Dr. Tearney values the personal connections that the MGH Research Scholars program has made possible. Early in his tenure as an MGH Research Scholar, Dr. Tearney met philanthropists Dorothy and John Remondi at a fundraising event. The couple took a keen interest in his work and went on to become major supporters. Past support from the Remondi Family Foundation has enabled Dr. Tearney to refine his TCE technology for the Barrett’s capsule. Over the course of about 10 iterations, the Barrett’s capsule has gotten smaller (it is now roughly the size of a large vitamin pill) while offering progressively better resolution. The Barrett’s capsule is attached to a tether containing an optical fiber. On the other end of the tether is an imaging system; once the size of a refrigerator, it is now more akin to a briefcase. After the patient swallows the capsule, it passes down the GI tract. The velocity at which the capsule travels is managed by maneuvering the tether. The imaging system reconstructs the data being transmitted as three-dimensional microscopic images of the organ being explored. These extraordinarily detailed images give clinicians the information they need to make a diagnosis. The advantages of TCE technology abound. It provides images of the entire organ — not just a small piece, as is the case with a biopsy. The patient doesn’t need to be sedated, which lowers costs and means the process can be completed in an outpatient setting in about five minutes. After the procedure, the capsule can be disinfected and used in other patients multiple times, reducing costs even further. And perhaps most importantly, the clinician can identify the cause of illness — and start the appropriate treatment — sooner. Susan A. Slaugenhaupt, PhD, scientific director of the Mass General Research Institute, hopes to endow the MGH Research Scholars program. Currently, Dr. Tearney is working on a primary care initiative for the capsule that has been funded by the Remondi Family Foundation. The generous gift has enabled the Tearney Lab to collaborate with the Department of Medicine to initiate capsule-based screening clinics in selected Mass General primary care centers. MGH Research Scholars is one of the signature programs of the Mass General Research Institute. Founded in 2014, the Institute aims to guide, support and promote the entire research enterprise at Mass General. Susan A. Slaugenhaupt, PhD, scientific director of the Institute, hopes to endow the program in order to fund new MGH Research Scholars every year in perpetuity and launch similar programs targeting other subsets, such as very early-career investigators. Dr. Slaugenhaupt just completed a five-year term as the Elizabeth G. Riley and Dan E. Smith Jr. MGH Research Scholar, an experience she describes as “life-changing.” Her research focuses on finding genes and then treatments for a handful of very rare diseases. Soon after he was named an MGH Research Scholar, Dr. Tearney crossed paths with Galit Alter, PhD, the Kristine and Bob Higgins MGH Research Scholar from 2012 to 2017, and currently the Samana Cay MGH Research Scholar. It turned out to be the start of a great friendship. Dr. Alter, a primary investigator at the Ragon Institute of MGH, MIT and Harvard, performs research to understand the immune system’s response to chronic infections such as HIV, tuberculosis and malaria. Within a year of becoming an MGH Research Scholar, she parlayed the $500,000 award into three new patents and more than $18 million in additional funding. Galit Alter, PhD, (left) parlayed a $500,000 MGH Research Scholar award into more than $18 million in additional funding. Also pictured is Mass General researcher Klemen Strle, PhD. Dr. Alter also appreciates that the program brings together researchers from different disciplines. At the time she and Dr. Tearney met, he was focused on diagnosing early cancer and heart disease. She wondered if his technology could be used to sample immune responses and immune damage deep within tissues. Dr. Tearney has since developed the technology so that it may eventually be able to fulfill the purpose Dr. Alter has in mind as well as other unforeseen applications. As she got to know Dr. Tearney, Dr. Alter thought the Gates Foundation — which already funded her work — might also take an interest in his research. But first, she encouraged him to emphasize the potential of his technology to enhance understanding of infectious diseases, particularly those of the gut. This was a critical shift. Recognizing that diarrhea is the second leading cause of death globally among children under the age of 5, the foundation awarded Dr. Tearney a large grant. Moving forward, Dr. Tearney will continue to focus on bringing the Barrett’s capsule to primary care settings. Moving forward, Dr. Tearney will continue to focus on bringing the Barrett’s capsule to primary care settings. This work could lead to the development of other primary care-based screening technologies that could catch diseases early and save thousands of lives.